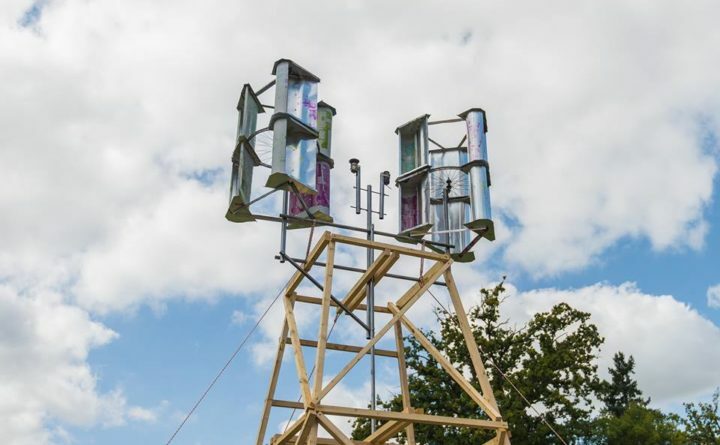 A DIY wind turbine designed and constructed by Daniel Connell. The project only costs $30 to complete. Living off the grid — sustaining your energy needs without a link to a power grid — is necessary for some homesteaders, given the location of their properties. For others, may be a matter of committing to self-sufficiency, or separating oneself from some of the modern trappings that bring daily stress. Even with the energy needs of daily life like cooking, lighting and heating, off-grid energy systems can be an option for your homestead if you are willing to commit a little capital, creativity and technical know-how. “There are a lot of options available, more than people generally think of,” says Daniel Connell, a designer who shares open-source, low-cost alternative energy plans and tutorials on his website OpenSourceLowTech. There are some potential pitfalls to consider before going off the grid as well. Brian Betz, manager at Backwoods Solar in Sandpoint, Idaho, has been living off the grid for over two decades. He cautions that off-grid energy users should understand their systems before going off-grid and prepare for potential pitfalls, including unexpected maintenance costs and the need for backup energy systems in case their primary system fails. One of the most important aspects of going on or off the grid is commitment to the lifestyle, regardless of the reasons you decided to make the transition. Before trying your hand at off-grid living, the first step is to consider whether you can meet your energy needs with alternative systems. How do you power an off-the-grid system? There are many options for off-grid power generation, including solar, wind, hydroelectric, biomass and biogas. Solar energy uses photovoltaic panels to harvest the sun’s energy and convert it into electricity. Wind and hydroelectric energy systems harvest the kinetic energy of blowing wind and moving water, respectively, for energy. Biomass systems burns wood and other organic materials, while biogas systems use collect flammable methane gas from waste to burn for energy. Each have their advantages, but ultimately, the best off-grid power system will depend on the resources you have available on your land. If you are in a windy place with a wide clearance free from obstructing buildings and trees (or local zoning ordinances, for that matter), wind turbines might be best. If you live in a sunny area without many tall, shady trees, solar is a reliable option. No matter what you choose, Connell says it is important to keep your energy sources diverse if you truly want to go off the grid. Having multiple energy sources will make sure you are equipped with energy in case of emergencies. A homestead powered by solar alone will find itself in trouble after a string of cloudy days, even with the benefit of some storage (lead acid or lithium ion batteries are most common for storing energy produced through alternative sources). Even still, Connell is confident that anyone who wants to power their homes with alternative means can do it. “If you have access to a roof or a back garden, you should be ok anywhere in the world,” Connell says. Is it legal to live off the grid? Again, location matters. Some states require you to be connected to local utilities. California energy codes require grid interconnection for single-family homes. Homesteaders looking to the leave the electric grid in Pennsylvania are required to contact the local government for ordinance, fee, and licensing information. In contrast, going off the grid in Hawaii is not only legal but often encouraged because of the limitations of the existing grid system. “The legal landscape of what you can do and under what conditions changes depending on the state or the town, and even then it changes over time,” Connell explains. Check with your local government offices for the rules in your area. The cost of going off the grid will come down to what your energy needs are. According to Betz, the size of the homestead matters less than the “load,” or energy needs, of the people living there. While the average American home uses about 30 kilowatt-hours (kWH) of energy per day, a typical off grid house might use anywhere between 2 and 8 kWH. “An offgrid home is designed for low electrical draw,” Betz says. Betz estimates that for “just a few lights and charging a laptop,” you could set up an off-grid energy system for between $1,000 and $3,000, but a system for a small homestead usually costs somewhere between $5,000 and $7,000. A back-up generator will cost an additional $500 to $5,000 depending on its capacity. “Most systems we sell for a full-time off-grid household start around $10,000,” Betz says. “We don’t do a lot above $20,000.” Even so, budget matters. “The people that really struggle are the ones on a really tight budget who can’t afford the system they need,” he adds. In the long run, though, an off-grid energy system can save you money. Betz says that depending on your location, it can costs thousands of dollars to connect your property to the grid in the first place, plus the monthly bills you will incur from powering your homestead. With an off-grid system, you pay once to set it up and then perhaps a little bit every so often for maintenance. As the energy provider for your household, though, you are free from the usual monthly expenses from the grid — and any unexpected long-term outages or disconnections grid users may experience.